HIKING® focuses on the production and sale of various types of concrete power trowel machine(Power Trowel Machine and Ride on Trowel Machine). The products have passed the quality certification of ISO 9001-2015, and have good reliability and durability. 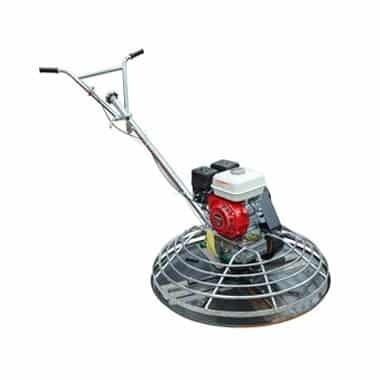 The Walk-behind Concrete Trowel Machine can smooth and polish concrete surface, which saves manpower and improves work efficiency. This machine is dual-purpose (using both flattening and calendering blades). When the machine is used, the flattening blade is first and then the calendering. It is easy to operate, time-saving and labor-saving. It is dozens of times more efficient than the manual polishing. 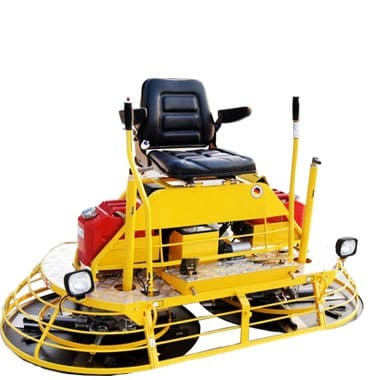 The Ride on Trowel Machine is a fine polishing machine with the rough concrete surface. 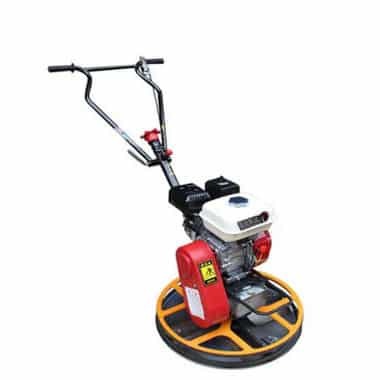 The surface constructed by machine is smoother than that constructed by man, which makes concrete surface more compact and durable, and it is more than 5-10 times more efficient than walk behind power trowel machine. The main structure of the polisher is a spatula rotor driven by a gasoline engine. A spatula is installed on the bottom of the cross in the middle of the rotor. The inclined direction of the spatula is the same as the rotation direction of the rotor. The triangular belt is driven by the gasoline engine to rotate the spatula rotor. When operating the polisher, first light the fire, hold the control handle, push forward together to move forward and pull back together to move backwards. On average, 100-300 m2 per hour can be achieved, which can improve the work efficiency dozens of times compared with manual polishing. 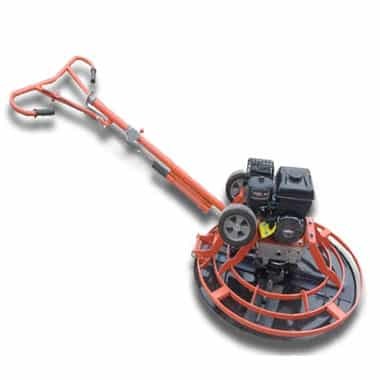 Usage of the Power trowel machines: It is a kind of polishing machine with coarse and fine concrete surface. The surface constructed by machine is smoother and smoother than that constructed by manual work, which can greatly improve the density and wear resistance of concrete surface, and the efficiency is more than 10 times higher than that of manual work. 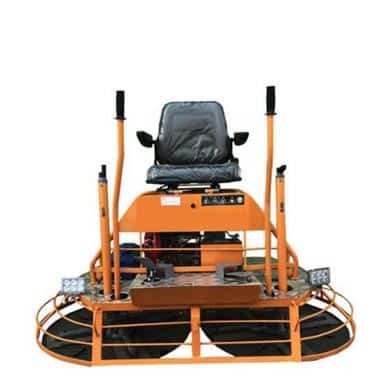 The polisher can be widely used in the concrete surface of high-standard factory buildings, warehouses, parking lots, squares, airports and framed buildings. It is the preferred equipment in concrete construction. 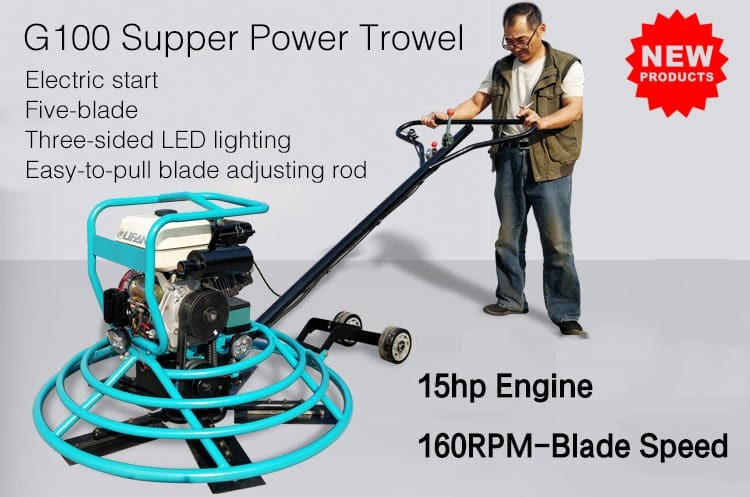 Classification of the Power trowel machines: The existing polishers can be divided into disc polishers and vane polishers according to the type of their working devices, including Walk behind power screed machine and Ride on power screed machine. According to the power, it can be divided into two types: electric type and internal combustion type. 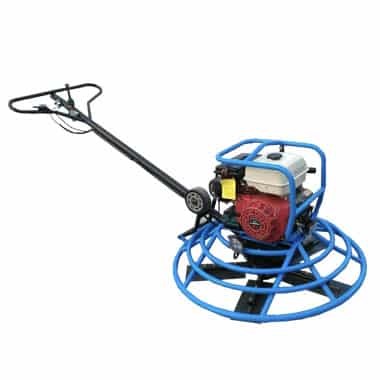 The disc polisher is mainly used for concrete grouting and smoothing, while the vane polisher is mainly used for polishing in the follow-up construction of concrete. 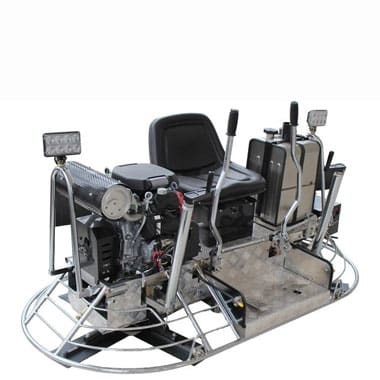 It is a kind of concrete ground construction machinery with good construction quality and high efficiency. The working principle of the polisher is that the engine/motor is decelerated by three-stage gears and driven by two relative rotating output shafts respectively. The polisher is pressed to the ground to complete the operation of compaction and polishing under the action of mechanical self-weight. (1) Clean the base of the floor first, and when there is no water, use plain cement slurry to coat the bonding layer about 2 mm thick. (2) Bring the fine stone stick from the centralized mixing place with a trolley, pour it on the floor base of the building which has been brushed with plain cement slurry, spread it with a small spade, and then scrape the 2-meter scraping strip flat. The paving thickness of fine stone concrete should be controlled at 15-120 mm. (3) After scraping, the dry sand ash will be evenly removed on the surface about 2 mm thick. When the dry sand ash absorbs water in a wet state, it can be applied with the polisher. (4) The first time polisher compacts the first light repeatedly in both vertical and horizontal directions. If there is no slurry or dry crack in some places, it should immediately spray dry sand ash and spray a small amount of water before plastering. 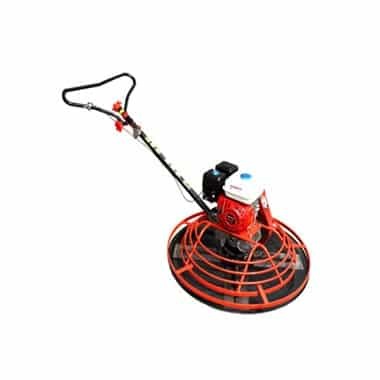 If you need the concrete leveling machine, please check: Concrete power screed and Concrete Laser Screed, Now Good quality and Good price are offering.